Is Windows 7 still best for business? Since Windows 8 (Vista 8?) has been lapped with 8.1 I'm happier with the user interface and recently put my Windows 7 laptop to bed. Windows 8.1 has been installed on a number of machines from 32 bit to 64 bit with no real problems. I've used it for gaming, coding and photo editing. I still feel a bit lost with the lack of a Start Menu but the visual appearance of the Start Button on 8.1 makes all the difference. 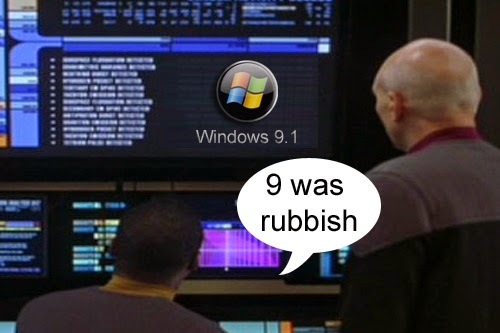 However, my success may be short lived, as Microsoft have decided to release Windows 9! I presume windows 9 is an all encompassing upgrade to Windows 8 which takes a step back from mobile devices. I've heard that Microsoft will release Windows 9 as an upgrade, downloadable from Windows update or Windows Store. RTM is likely to be rolled out in 2015 but you'll be able to get a beta well before then. Windows 8.1 has already been service packed a number of times. My updates history has already seen Windows 8.1 update and I expect MS to release another update (8.2 and 8.3) in keeping with the great tradition of service packs. Regardless of the success of Windows 8.3 and Windows 9 (or Windows 9.1), Windows 7 is the standard replacement for Windows XP in a business environment, and will continue to be so for quite some time. For office PC's you really don't need the latest and greatest Windows 8 computers and as long as you have migrated from Windows XP you should be fine on Windows 7 premium and Enterprise Editions. Windows 7 works perfectly well for PC Gamer's and CUDA developers, anyone considering cutting edge Media development should consider all upgrade options carefully. Virgin Holidays Unleash Telephone Recycling Mojo! Do we buy telephone systems for cash?